They took in 12 inches? Thank you Bill for sharing all those memories!! I never thought that you guys were "villains" though, you were just the race's first strategic players!! But why would you think that it was y'alls fault that Momily went out? It was their decision to not keep looking for the car, in no way were you all responsible that I could see. Just a sad time for both of you because I know you were friends. I still laugh about the plane though! And didn't the language get a little ?? The full explanation of the Tunis airport thing. Is that also the story you told Karyn? Because whatever you seemed to be telling her, the editing certainly seemed to make it look like you were lying. That said, what did you think of the first three teams gone? Did you like Matt & Ana, Kim & Leslie, and Pat & Brenda? I will have to look at the DVD to see what was said to Karyn, I know I wasn't telling the whole truth because Karyn asked a direct question about us delaying the teams, but about pushing Nancy & Emily, that never happened by our will to be mean...Nancy and Emily were pushed into us by someone behind them....remembering, we were the first in this security line, it is hard to shove someone forward past you, when those people are behind you to begin with, isn't it? It is possible Nancy was bumped by Joe's back pack. It got very nasty for a few minutes between Drew & Kevin screaming for us to get out of the way, then production stepped in and stopped the chaos, we were allowed to pass in an orderly manner as we had tried to do before Kevin and Drew arrived. Matt and Ana were very nice people, we were only allowed a few minutes to say hello to them before they were off to sequester. Because we were always at the front of the pack we did not see much of them except at Songwe Village after they were eliminated. They were crushed to be the first to go, really nice people. Kim and Leslie we saw more after the race was over. We had a blast with them in Las Vegas before the first episode was aired. Pat and Brenda we called Thelma and Louise, this was a good team, and had they not made the error in NY would have given some very good TV! Pat and Brenda are very sweet, and competitive! It’s never to early for a Chardonnay! hen you were in Krakow, during the intersection where you ate a 25-inch sausage! That was one of my favorite tasks in all-stars! Was it really hard to eat, because we saw Dustin puked after she finished her sausage... What are the things happened there that were not shown?? That sausage was very tasty....but very long! It had to be at least two feet long. It was not 6 inches as someone earlier said. We all had to eat the two feet individually. Joe was the first contestant finished, we had to wait while Eric played the game and farted around pretending to barf. I probably would have done the same if I knew the team I was paired with would be eliminated. They showed the most important parts of the task, it was miserable because on the bus trip to Krakow they had given us sack lunches to make sure we were all very full! We should have known better! There was much more throwing up than was shown, everyone eventually did throw up, except for Joe. I have a question for the Guidos! First of all before the question, I love you guys!! you are most likely my favorite team out of all 14 seasons! BUT! ok, seeing how you guys were on season one, the baby of all seasons, everything was so undeveloped. but, how did you feel when you got to be on season 11 when you got to experience the imporved all extra deveolped race course. Like, the clue box being an indivudal box made for the show. Not a wooden box. and the mat being a picture of the world and not a yellow plastix slippery square that you fell on in France ? lol I'm sorry if my question dosent make grammical sence or even sounds logical but I think you should be able to get what I'm talking about. Nice to see Tammy Gaghan! How's Carissa??? It's unfair how everyone asks about Carissa, but not, say, Bill and Billy. How are they, Tammy? Everyone is doing great thanks for asking. Bill still travels a lot overseas for work and is in India right now. The kids are getting big. It is so funny to look back on how small they were during the race. Billy has changed the most and is as tall as Bill now and Carissa is only about a 1/2 inch shorter than me. I will try and post a recent picture of both of them. so, do you think they'll be up for All-Stars three? I wonder what they look like now! I think I got lost for awhile - sorry to take so long to log back in! We heard we were about an hour behind the last team at that point. The people of Russia were very helpful for the most part. The hardest part was when we had to walk all the way back from the park because we hadn't taken a taxi. We couldn't get enough money to take the taxi one way let alone back and forth so we walked for more than a couple hours. The production teams are not allowed to help you in any way and it was up to us to figure out how to finish out the leg. The poor camera and sound crew had to walk the whole way with us carrying all their equipment. It was getting really cold out and we just kept apologizing the whole time for making them walk so much. My first reaction was just "okay, how can we do this and get our way to the embassy to deal with the passport along the way". I just wanted to get the leg done and I didn't really care about following the rules because I was worried about Dallas being out on the street and begging without a passport. In reality production was watching out all along the way to keep us safe so we just decided to do whatever we had to. It really was wonderful to have had the opportunity to see how wonderful the people on the street were. Great to see you again, Toni! How's Dallas? Dallas is doing well and very busy. He's currently working on avoiding his mother - the race has required him to spend more time with me than before. We'll be doing a talk at his college parent day in April so it may crimp his party! Uhm... I don't know if this was asked before, but what happened at the Roadblock in Puerto Rico or Panama?? (The coffee bean RB) You spent a lot of time there... And I think I saw Billy's picture in his facebook account... he's so tall right now... and Carissa, seems she's still a baby girl... hehe, but already a grown-up! 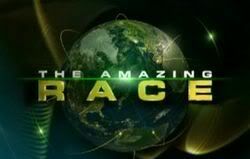 Are they still watching The Amazing Race?? I can answer about Dallas & Starr. They're not dating anymore. edited by puddin .. stay on topic please! Also, are you still watching the race Tammy, and is Bill too? I wished they could have shown your mom hilarious side on TAR 13!! Glad you think I'm hilarious - Dallas considers me embarassing! We actually didn't give them much to work with during the race - we got really focused while we were racing. But boy were the pit stops and rest periods lots of fun!!! Someday I'll tell you about the Moscow airport. I do have to say I think we had more fun in our down times than it appears the teams this season may have had. We thoroughly enjoyed spending time together with the other teams. For me it was as much a part of the race experience as the actual race. They should do a second reality show - "backstage on a reality show". Great to see you Mom Toni. Hope all is well with you!...Finally my local TV Channel that airs TAR is going to show TAR13. So I get to watch your race over again And see you! Mom Tammy. Lovely to see you here again! Great to hear about the Gaghan family! Team Guido I really need to watch TAR11 again because I cannot remember the question I wanted to ask you! I am curious, what happened after the leg you got eliminated? I don't know if this was the one you wanted to tell us later, you don't have to answer this question if you were referring to this question.